05/20/12 – May 17-20: KINETIK MUSIC FESTIVAL 5: 4 days, over 30 bands! 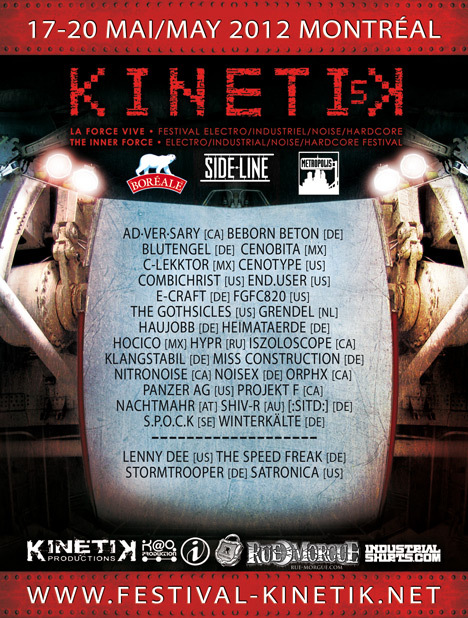 May 17-20: KINETIK MUSIC FESTIVAL 5: 4 days, over 30 bands! May 17, 18, 19, 20 - 4 days & over 30 bands! Kinetik Productions is proud to bring you back after the success of the last editions, the Kinetik Festival 5.0 from May 17 to 20 2012 in Montreal, Canada. Don't miss your chance to be part of this unique experience with some of the best acts of the Electro-Industrial scene performing during those four days!